I have a client/acquaintance that has recently received his FFL. He is able to get me a Glock 19/3 frame. I'm going to build it into something kinda racy. I have minimal experience with Glock firearms. I have in the past owned one, a 19/4. It was cool but I don't love plastic guns. So I sold it. I have not had a desire to own another until recently when I saw the plethora and ease of assembling and building them and how much fun it can be (anyone that knows me knows I can't help building sh--stuff). So, I have the frame and recently purchased a LPK and locking block kit from Lone Wolf. It came with the trigger and all the attendant parts. What I'm looking for is suggestions on parts to buy, parts to avoid buying, etc. Any tips and tricks from experienced "builders" would be much appreciated as well. Stippling of some type, I may try it myself. A compensator of some type --- I'm totally lost on this one and have zero experience with comps on hand guns but will run this in some local games hence my wanting one. I'm for sure looking for recommendations on magwell and extended mag release. The magwell is not as tough, the mag release is. I dislocated my thumb some years ago and don't have full function. Pressing a release is tough on the standard size. Especially the 3's. On my 1911's I run a paddle release. I don't love it but it's what works for me. Color... Well, that's up in the air as well. We'll see how that rolls. Again I'm looking for suggestions on which way to proceed and which way to avoid. And, before it starts, this is not my first rodeo. I know about the pitfalls of building, the extra cost involved, etc. Additionally this will not be a HD gun. Essentially I have every avenue covered already and am in the toy buying phase. Mrs used an overwatch precision trigger. kkm barrel. Lpk and upk stock. Please pick up the white courtesy phone. She's happy with the KKM? Happy with the Overwatch? Any experience beyond what she has? Any internal tweaks or was it assembled and fired? You're still buying ammo, correct? Switched out the plunger tip with her 19/4, then ordered that tip as a replacement. As for the ammo question, just checking to make sure you're not running hot reloads or anything. 9 is super cheap right now. Even I bought some lately. I hated it but for the price it was just too easy. ive talked with @Modern Materiel whom I believe collaborate with tier1 . Best practice send in Rmr or mounting plate with slide. Are you doing that yourself? Why not? I'm currently negotiating a mill purchase. I plan to mill for a dot myself. No plates. It'll mount directly to the slide. I will not be running irons. I may have the front sight hole welded closed once it all comes to plan. We'll see. Home Range: We can shoot in NJ? @Bully Upk is not totally stock. All Wolf springs, apex extractor and spring. Overwatch trigger is like butter, I loooovvveee it! Did you try anything else or just the Overwatch. Did you try any triggers prior to settling on the Overwatch? 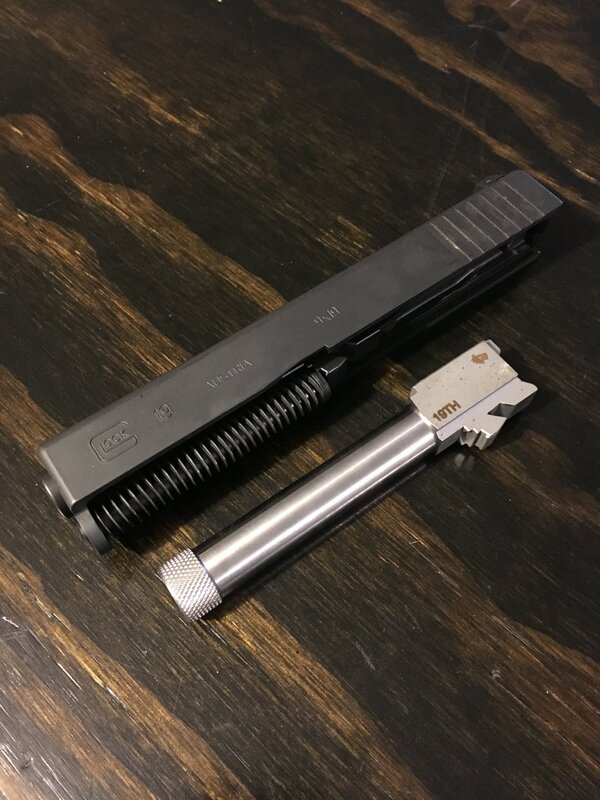 My buddy mentioned that he has a stock 19 slide with a stock barrel and a threaded barrel sitting around and he'd be willing to part with them. All stock Glock 19 with an additional Lone Wolf threaded barrel. I'm probably going to comp this pistol so that's cool. When I have the family together I'll post a pic of the components so far. Thanks all for the help.